Astronomer Edwin Hubble made the discovery that the distance between all galaxies in space is increasing, the galaxies are moving away from one and other. It's the Big Bang theory that states the universe is believed to have begun during an unfathomable accelerated expansion of space, approximately 13.7 billion years ago. It is believed that all of the matter (the physical substance which occupies space-the area around us, the moment the Big Bang occurred. What do you think the Big Bang would be described as? What do you think it look like? What went "bang"? Your predictions should be recorded in your individual Google document, Space Exploration – Explaining the Early Universe. Once you have finished your brainstorming you should move on to Time to Research portion of this activity. While you are reading the notes below and watching the videos, you should be making notes in your individual Google Document, Space Exploration – Personal Notes, if you prefer you can record your "personal notes" on paper. Early astronomers (people who study objects in space) were able to observe outer space by using the the best instruments of the time, early telescopes. In the 1920s the power of the telescopes increased, suddenly astronomers were able to see more detail when looking to outer space. Suddenly there were more celestial bodies that were discovered. Celestial bodies is a general term for all objects in the sky; including the Sun, Moon, planets, and stars. Astronomer Edwin Hubble an American astronomer was the first one to identify other galaxies besides the Milky Way. He estimated the distance from earth to 46 different galaxies. 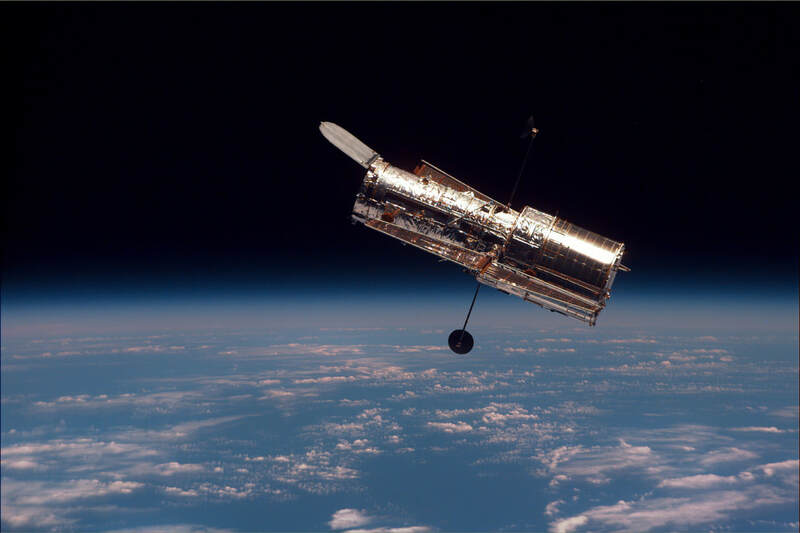 Hubble proposed that the universe is expanding. The galaxies which are further away from Earth are moving apart faster than those closer to Earth. 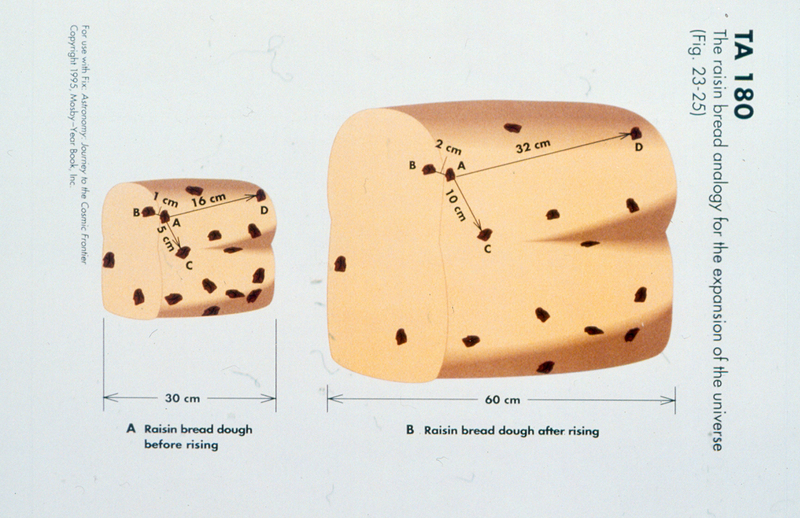 He used the analogy comparing an uncooked loaf of raisin bread to one that is put into the oven. 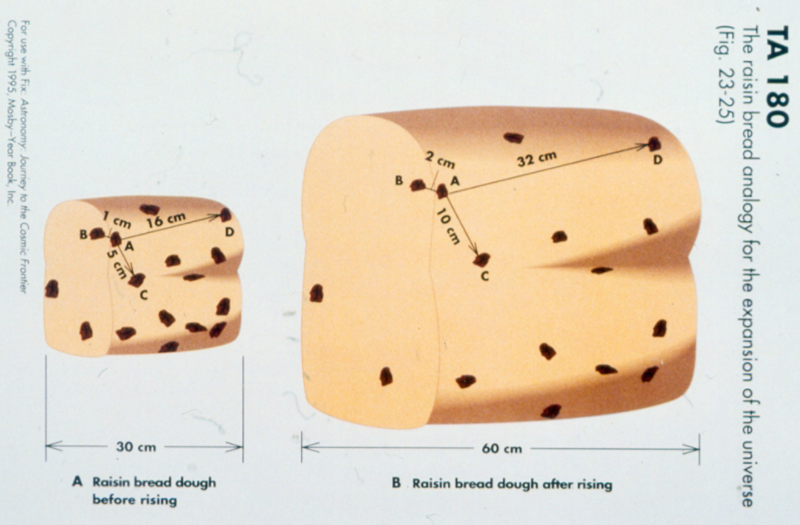 As the dough rises the raisins (galaxies) are moving further away from each other. The same illustration could be drawn with chocolate chip cookies, the chocolate chips are closer together when they are dropped on the cookie sheet for baking; then during the baking process, the cookie expands and the chips begin to separate. Edwin Hubble figured out that galaxies were moving away from the Earth at a certain speed, which was proportional to the distance from Earth. He did this based on his understanding of the electromagnetic spectrum. Visible light is only one form of energy that reaches the Earth from distant stars (Sun). 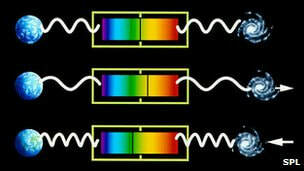 Many other forms of energy with various wavelengths can be measured. 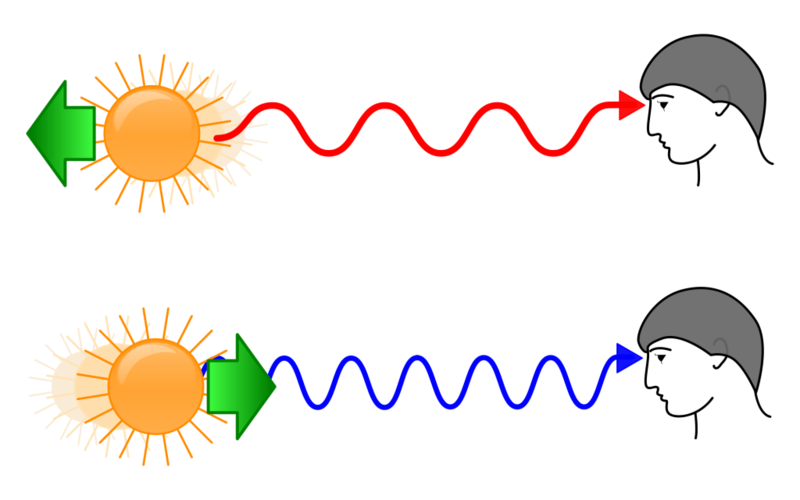 These range from long radio waves to the shortest waves which are gamma rays. In the figure on the left, there are three spectral patterns represented. Stationary (No Shift): the spectrum shows there spectral pattern in a star or a galaxy that is stationary (not moving). Blue Shift: the spectrum shows a blue-shifted pattern that indicates the star or galaxy is moving towards Earth. Edwin Hubble noticed that the light of the galaxies he was studying showed spectral lines that were shifted toward the red end. This red shift occurs because of the light’s wavelengths becoming longer. This is an indication the galaxies are moving away from us. Astronomers call this the cosmological red shift, which is evidence for the theory explaining the early universe. Today the most widely supported theory is that approximately 13.7 billion years ago an unimaginably tiny volume of space suddenly and rapidly expanded to immense size. In that time all the matter and energy in the universe was formed. This is known as the Big Bang Theory. In 1963 two astronomers Lemaitre and Wilson were monitoring microwave radiation in space. To their surprise they kept receiving background “noise” or signal interference. Their conclusion was they were actually detecting “cosmic” radiation. They believe this was radiation left over from the Big Bang expansion. 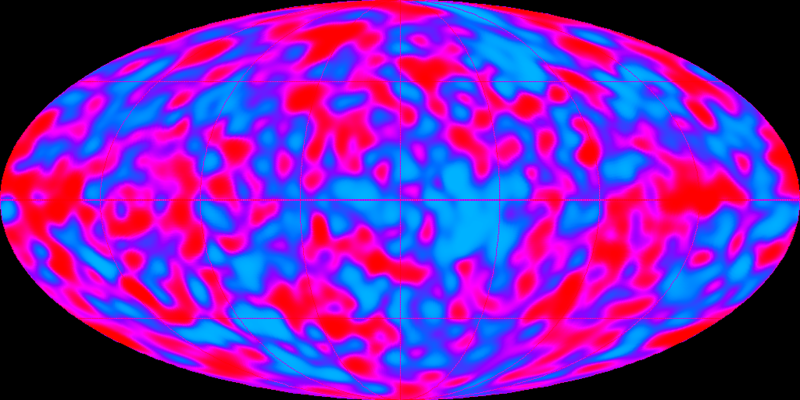 Strongest evidence to date comes from the COBE Cosmic Background Explorer. The left over radiation from the earth’s expansion due to the Big Bang forms reds and blues indicating the age since the expansion took place. The reds indicate hotter temperatures and the blues represent cooler temperatures which indicates the age since. ​Let's have a check in. Take the time to answer the questions provided to you; record your answers on the worksheet provided. (You should be able to answer the questions without having to refer to your notes). Return to "Formation of the Universe"